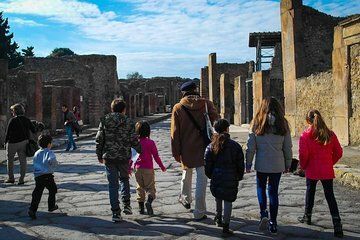 Go back in time two millennia with this intriguing 2-hour guided walking tour of Pompeii. Meet your local guide at the entrance of the ancient archaeological site and get ready to explore the incredibly preserved Roman city, which has been frozen since Mt Vesuvius erupted in 79 AD. Highlights include the Forum, a theater, a ‘fast food’ restaurant and even a brothel. Have children with you? Then choose the family tour, which comes complete with puzzles and maps to engage the little ones. On August 24 in the year 79 AD, nearly 2,000 years ago, the volcano Mt. Vesuvius began erupting. It blanked the nearby town of Pompeii, freezing the 20,000 denizens with its ash and molten lava, thus perfectly preserving this ancient Roman city. With this 2-hour guided walking tour, you can see the best that the archaeological site has to offer. Meet your guide at Cafè Hortus and prepare to be dazzled by this UNESCO World Heritage site. If there’s something in particular you’d like to see, tell your guide so he or she can tailor the tour to your liking. If not, there’s plenty of things to be wowed by. See the city walls and the Porta Marina gate that was once the entryway to the harbor of Pompeii. Explore the ancient theater where performances were regularly given. Gawk at what once was a Roman version of a ‘fast food’ restaurant, where vast vases still stand that were used for storing food. Stop at the Forum and learn about the political system in Pompeii and what the Forum was used for. Walk down the basalt-laden streets and squares of the city. See the blocks that provided stepping-stones across the often-flooded and sewage-filled streets; and view must-sees such as the Temple of Apollo, the Macellum market, and the public weighing scales. And, intriguingly, see the casts of victims who were immediately frozen by the volcanic eruption. Stop by the thermal baths, a popular pastime in ancient Roman times. And even visit an old brothel, also a much-enjoyed proclivity among Roman men. Your 2-hour tour ends at the original starting point, when you say goodbye to your guide. Family Tour:Have kids in tow? Opt for the family tour, which will intrigue children, thanks to games, puzzles and a map designed specifically for children. Your guide will also tailor the route in a way that is geared for the youngsters. It’s a truly engaging way for them to discover the city and learn about life here long ago. After two hours, the family tour ends at the starting point when you bid farewell to your guide. Our tour was excellent. So amazing and educational. We had 2 kids with us and the tempo of the tour was perfect so that they didn't get bored. Giuseppe was excellent and the 2 hour length of time was perfect. I was travelling with my husband and two children aged 14 and 11 and Giuseppe kept the kids interested despite the hot weather. This is a tour to remember. Michael was our guide and very personable and passionate about Pompeii. He taught us so much. Thank you again Michael! Great tour! Entire family loved it! Super tour and really an advantage having a private tour. We were happy with our guide who spoke perfect English and we were able to navigate around the large tour groups with our party of 4. Were able to get a great feel of Pompeii and the guide really brought it alive while we asked our questions. He was also able to take some family pictures for us so really think the private tour was the way to go! What an amazing experience for our whole family! Pompeii is huge and you need a guide. But if you have kids, you might not want to go on a 3 hour tour that includes the brothels...amiright?! Our kids, 12, 10, and 8 loved this tour! It ran a little longer than originally scheduled but it's because our kids were so engaged. Our guide spoke mostly to the kids which ensured they learned- the whole reason we were there! She even had a map game and stickers. I thought my kids wouldn't care about it, but they really enjoyed it- stickers and all! Finally a tour guide that spoke to them! Our tour guide was extremely knowledgeable- she was an archaeologist and loved working on the sites at Pompeii. This was a very memorable day for our whole family! I highly recommend this tour for your family. Our tour guide was friendly, flexible and knowledgeable! Excellent tour - we highly recommend! Our guide was very knowledgeable, and made Pompeii come to life. It was definitely a private tour, so it was just the guide and my group. 3 pm tour lasted a little over 2 hours and we got to see the sun setting on Pompeii with Mount Vesuvius in the background! Unforgettable experience and I will definitely recommend to others. Sabrina was a fantastic guide that added several interesting points for our kids, closing each area with a small game and rewards. We covered all of the areas we wanted to see and saw some interesting things we didn't know about. Well done!! Highly recommend! Natasha was fantastic! She knew so much about Pompeii and was friendly and helpful. She spoke so kindly to our kids and helped them appreciate what we were seeing. We wish we could give her 6 stars!